I have been reviewing our 2011 season and looking at what we did well and what we need to consider for next year. We had a busy year (busier than I expected)! The stats surprised me driving on 17 test days and completing 1580 laps, just short of 3000 miles of driving. We entered 25 races made 24 grids (missed the Formula Free race due to a broken throttle cable). We finished 22 races collecting 8 class trophies. The two we didn't finish, the first was a small accident that bent a suspension arm and the last DNF was a stone through the radiator. I was very pleased again this year with the massive effort put in by all the team to keep me running. Special mention should go to Kevin, Nathan, Andy and Tom who all went the extra mile. The new tracks for me at Oulton provided a real challenge and I look forward to returning next year. We missed the class win in the Formula Ford races and my spin at the Walter Hayes ended my progression this year. 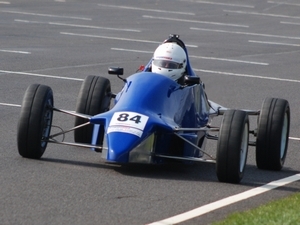 However with the new Nemesis and a new engine in the Formula Ford, I am looking forward to full race program next season. Thanks again to you and Lynn for all your support and advice.